Waverunners or Jet Skis as they are sometimes called have become one of the most popular sports throughout the world; from the warm waters of the Caribbean to the cooler waters of Europe and beyond. 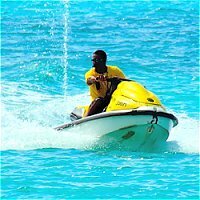 What could be better than exploring the beautiful crystal clear coastal waters of Barbados than by Waverunner which are available for hire from most bays, beaches and coves around Barbados. The Yamaha XL700, currently the most popular personal watercraft in Barbados, seats up to three (3) people, has a 701cc engine and, is fun and easy to operate. The large chined hull design make them stable and will rarely turn over unless driven recklessly. Duration of rentals are usually in 30 minute increments and prices will vary in and out of season. 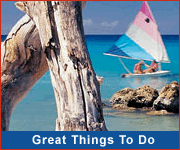 As a guide $50.00 to $55.00 US dollars for 30 min. would be an average price in peak season. All reputable operators will provide appropriate life vests and comprehensive instruction for all hirers. It is recommended that the rider wear a waterproof watch so as not to exceed the agreed rental time. Although Waverunner rental is fun, easy,and a memorable experience, it is important to operate your craft with due care and attention. Give respect to swimmers, snorkelers, divers, and other larger craft. 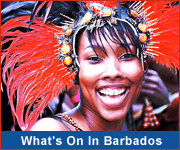 If you like the idea of a thrilling Barbados jetskiing adventure, you will love these fun watersports activities!